(30th March 2009): After a relaxing morning at Havelock island, we checked out of our rooms after lunch and set off for the jetty to reach there by 2:00pm. We arrived well before the time of departure, 3:00pm so that we don't miss the ferry. We had asked the hotel reception to purchase our tickets for the ferry the day before and so we had no hassles to board the ferry. We realized that nobody gives out the real information regarding availability or booking of the boat tickets so that the agents can fleece money from you by asking exorbitant sums just to book your ticket for you. So my advice is, don't fall for these guys. All correct information is available at the ticket counter and you can book the tickets in advance contrary to what the agents are going to tell you. The ferry departed on time and it took almost 2 hrs to reach Neil island. The journey on the boat was fun as we came out to stand in the open deck and could get cool breeze. We were served hot tea for Rs/-10, which was very good. No snacks though. Unfortunately, by the time we landed on the island, it was already time for sunset and so we did not get any time to see anything much on this island. The sight of the beach next to the jetty was sad as there was a lot of rubbish and waste lying on the beach which sort of put us off. So far all the rest of the places had absolutely clean beaches. Anyway, we hired a taxi and asked him to take us to the Hotel, a government accommodation, which had only 5 rooms and all were booked. We dumped our bags in the room and asked the taxi driver to take us around wherever he could before it got dark. He took us to a beach called "Sitapur" to see the sunset and made us walk quite a stretch of the beach right till the end. Basically, there was nothing much to see there. We did see the sunset and a few foreigners camping on the beach. See photos. 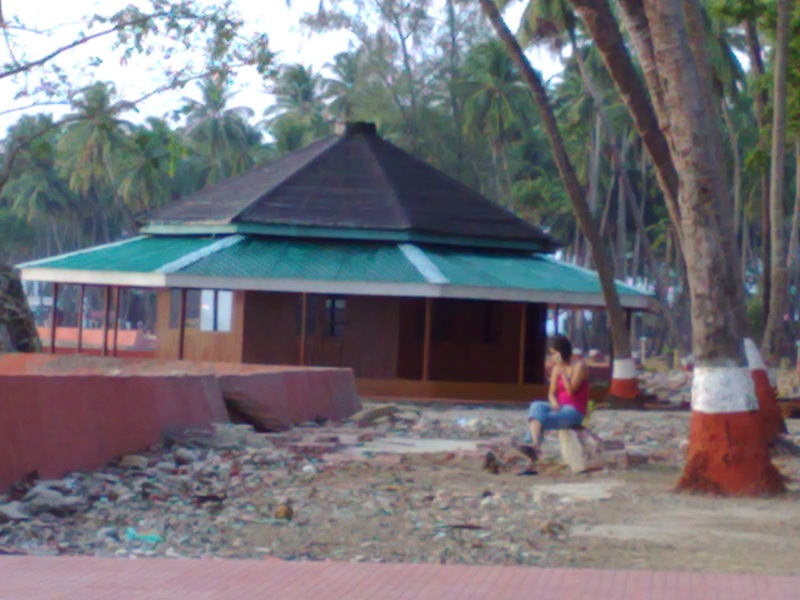 There are four popular beaches on Neil's Island, namely; Sitapur, Bharatpur, Laxmanpur1 and Laxmanpur2. Laxamanpur beach has some natural rock formations like a bridge which can be seen only during low tide and you need to walk a bit on the rocks to get there. There are also some natural caves on the other Laxmanpur beach, which also can be visited only during low tide. Then they make you walk in the shallow waters in Bharatpur beach to see the corals. Apart from that there really isn't much on this island to see. Unfortunately for us the tide was high all the time we were there. Neil island has dense forest all around and very scarce population. It is a small island and so one can hire bicycles to roam around the place, from one beach to another. Though you need time to be able to do that. I personally would skip this island altogether from my itinerary. There were many other islands that we could have visited instead. 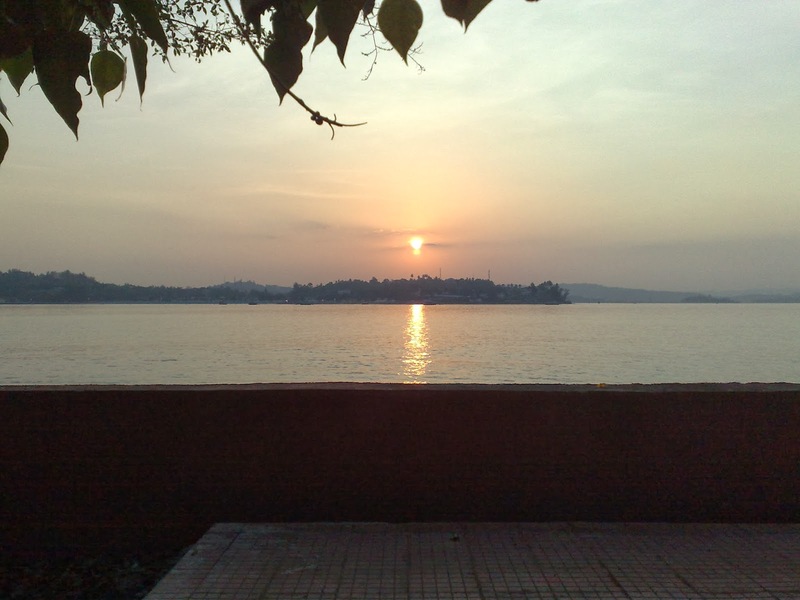 Well, we did not waste much time here, had breakfast early next morning and took the first ferry at 8:30 back to Port Blair. The tickets for this journey are given on the ferry itself and so there is no need for advance booking. It took us another 2 hrs to reach Port Blair. There we waited on the jetty for the boat to take us to Ross Island which is just opposite to Port Blair and is only 10 minutes away by boat. There was a naval hired boat that came specially to pick us up. We reached Ross Island at noon and in time for lunch. 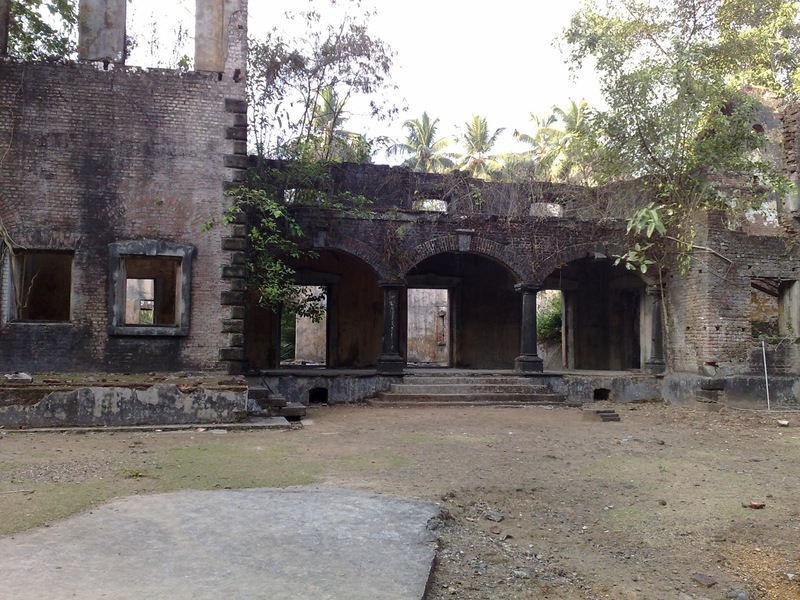 Ross Island is special due to its historical background and so it becomes mandatory to make a mention of it here. This island was chosen very carefully by a Marine Surveyor Sir Daniel Ross, after whom this island has been named. During the British Raj, many Indian freedom fighters struggled to regain our independence and were becoming a pain in the **s for the Britishers and so to contain them and punish them severely they began to search for a place. They found Port Blair and the cellular jail was constructed to penalize these freedom fighters. Another jail was constructed in Viper Island for the female prisoners. 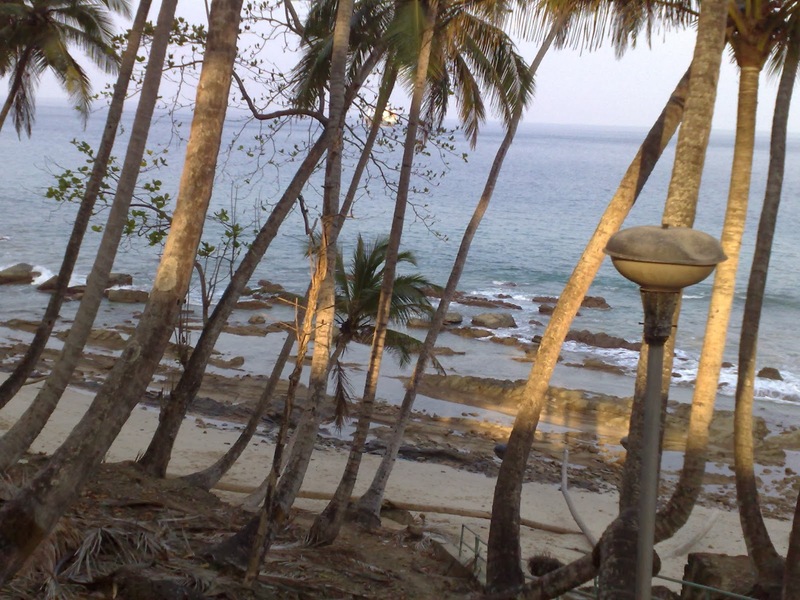 Ross Island was the perfect place for the British officers to put base and be able to guard Port Blair from a distance. They build their residence and office buildings on the island and made a small settlement with all the lavish comforts and lifestyle that they were used to back home. To build this place they used the convicts as laborers and rickshaw pullers. The island is very small, but they managed to build everything they needed for the place to serve as a headquarters to the prison. Col. M.L. Ferror was appointed as the Chief Commissioner and he stayed at the huge Government Mansion that was the center of attraction of the place. It had many rooms that served as offices and home and had a huge ballroom on the first floor. There was a cannon out on the driveway. More about the history later, first let me update you on our movements so far. We were taken to our rooms which were really big with an attached bath and sitting room. The charges for the rooms are different for the day and for the night. Not many people opt to stay overnight on the island. 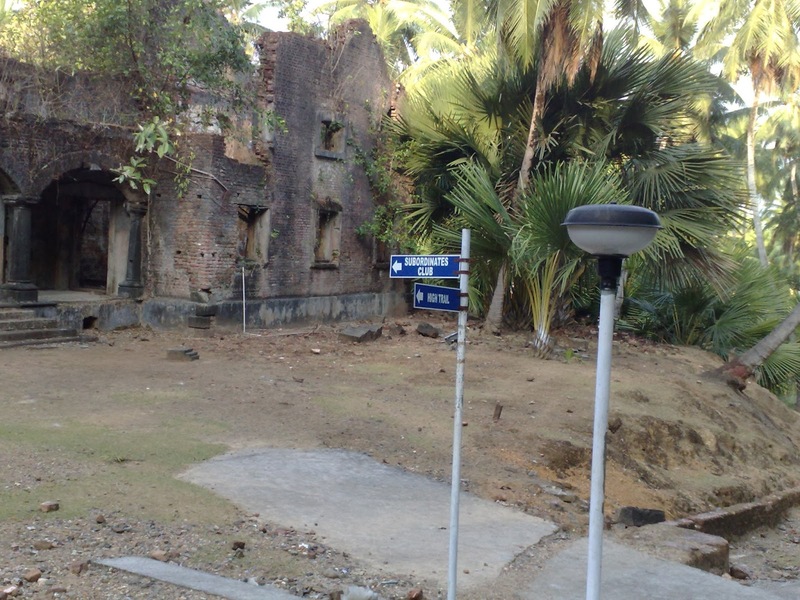 The whole place is being maintained by the Indian Navy as it had been handed over to them by the British after they left. The Indian Navy has turned the place into a tourist attraction and charge a minimal entry fee of Rs 20/-. The place is well looked after and kept clean with well marked areas. The place looks very attractive and peaceful. 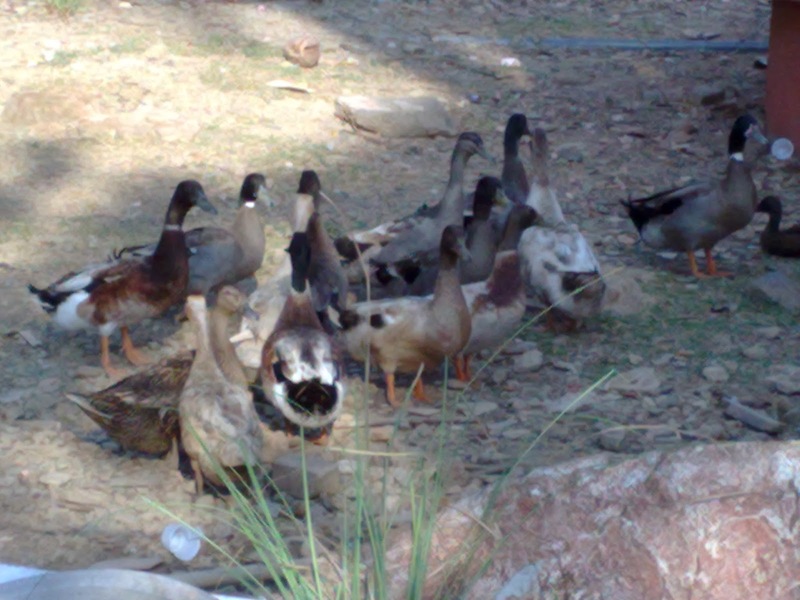 There are plenty of deers, peacocks and geese here that roam around freely unmindful of people. You can feed the deers with your hands and they also enjoy the cafeteria food leftovers, as we discovered later. It was really amazing to be amongst nature this way. Since the cafeteria was far, we asked for packed lunch to be sent to our rooms. We had hot Chicken Biriyani with papads which was very delicious and we enjoyed the meal thoroughly. Then we rested for a while as we were told that the deer come out at around 3:30pm to the park area. 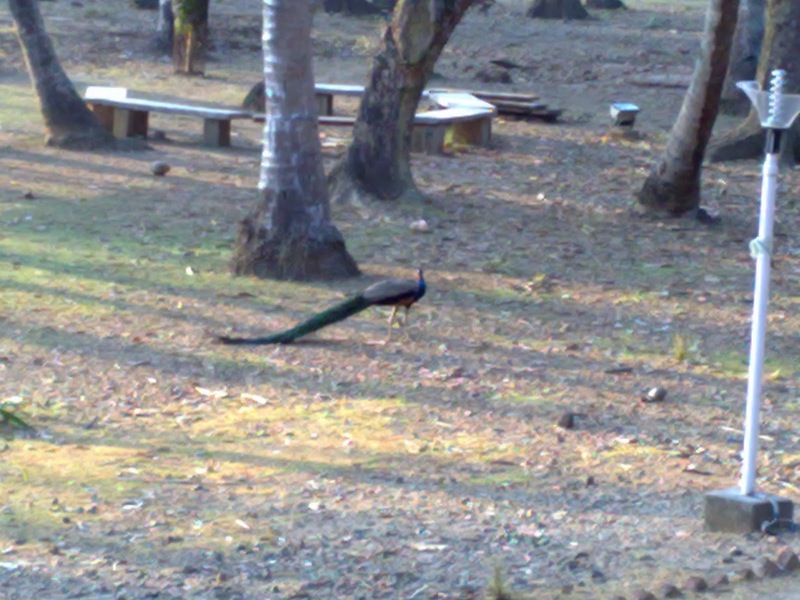 At that time we got up and proceeded to the park and indeed saw a sight that was unforgettable. 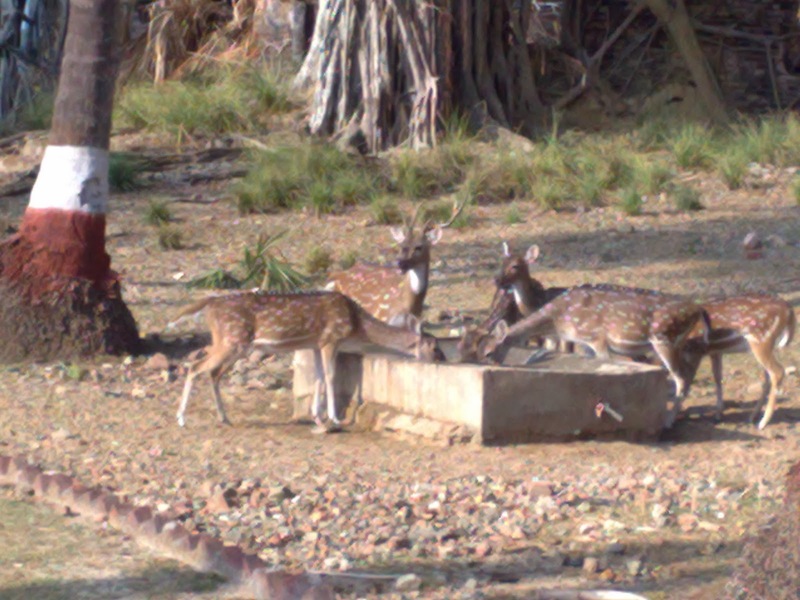 Deers all over the place grazing on leaves and drinking water from a trough. Although they were vary of us, they stayed their ground as we approached and we were able to take pictures with them. We then walked around the park to explore the area further. There were steps going up to a pond (which used to serve as the main water reserve for the Britishers). Further ahead was a Presbyterian Church whose main structure is still standing tall. From this place there are trails leading in all directions to the government house, troops barracks to the left side of the Church and British Officer’s Mess/Club, the Cemetary and the Ferror Beach to the right side. We proceeded towards the beach and spent some time taking pictures of ourselves and the beach. Ross Island was the first to be affected by the tsunami in Dec 2004 and the evidence of that can be seen on the beach. Parts of the island are now submerged under water. After sunset, we headed back to our rooms and had the dinner that had been already sent to our rooms earlier as the cafeteria closes down at 5:00 pm. We were the only people left on the island other than two security personnel from the navy. The feeling of being completely secluded on the island was fantastic. Since the whole place is run on generators, they tend to switch off the power supply in between. So, to our surprise, the power was turned off at 3:00am and thereafter I just couldn’t go back to sleep. For one, there were the mosquitoes to contend with and second the heat. Around 4:00 am I came out of the room and sat out for some time. There was a cool breeze blowing and I also startled a deer who was probably sleeping. The others were still sleeping and so to pass time I went to the Memorial that has been built and shows the complete history of the place. I saw all the pictures of the old Ross Island as it used to be then and the buildings that used to exist. There is also a copy of the letter written by Col. Ferror to his mother in which he has described the place in detail as to how he found it on arrival. It was really interesting to read everything in first person and one could imagine the plight of the Britishers in this place. After reading the history, I became really curious about the place and had a strong desire to locate all the places mentioned. The place that was most mentioned was the “Settlement Club” which seemed to be the Exclusive club for all senior British Officers and their wives. It was considered to be a status symbol to be a member of this club. 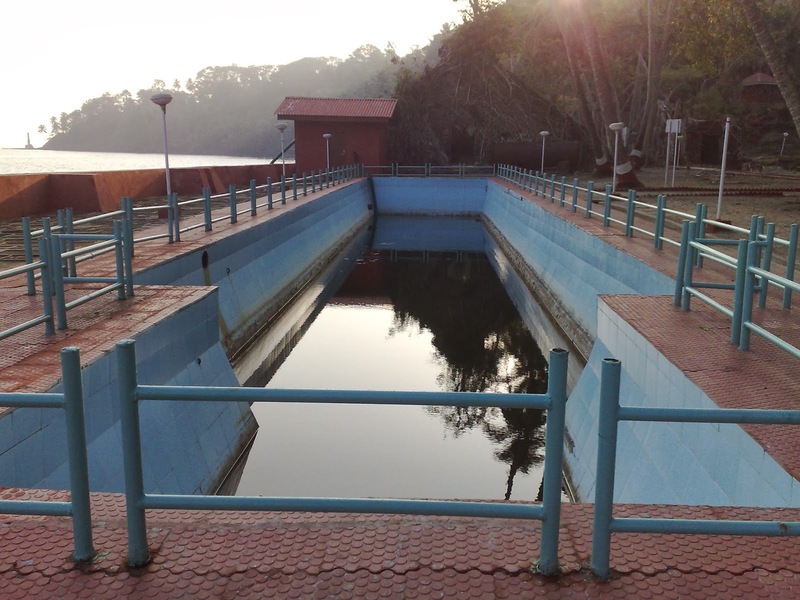 They had a swimming pool filled with sea water where they used to come for a dip in the evenings. This was right next to the sea. The other junior white officers were not allowed entry to this place and had a separate club of their own called the “Subordinate’s Club” . I took a trek around the island and located the swimming pool. There is a printing press building right next to it. Ahead of that is the bakery, which used to be quite popular. Near to this place is the Farzand Ali Store who had anything and everything one could need on the island. This store has been turned into a museum and it also contains a first hand account of an Indian Naval Officer who was caught on the island during the tsunami. I walked all around the island and saw the troop’s barracks and the government house which has been destroyed completely now. There are just a few walls still standing. No cannon in the driveway. All the splendor and grandiosity of the place reduced to rubble and neglect. One can still see the cooks and servants quarters below. I then came upon the “Subordinate’s Club” and was again taken in by the destruction and neglect of the place. There are just haunting remains of the place left. 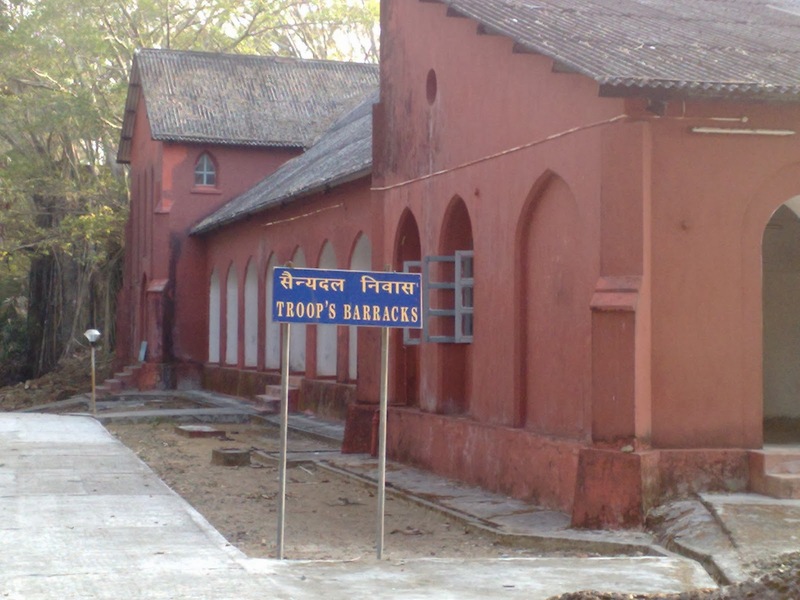 The whole place had a very sinister feel to it and I quickly went ahead back to the park area, where I saw remains of a post office and back to our rooms on the way are the British Officer’s quarters, a Bazaar, a temple and hospital complex and some more troops barracks. There is also a trail to a light house that was built by the British and near that lies a cannon that used to be fired at noon everyday. I could imagine the whole place coming to life and the kind of life they must have had on this island. There were two tennis courts near the swimming pool, which can still be made out clearly. The place somehow evoked all kinds of mixed emotions in me. I just can’t describe the feeling. 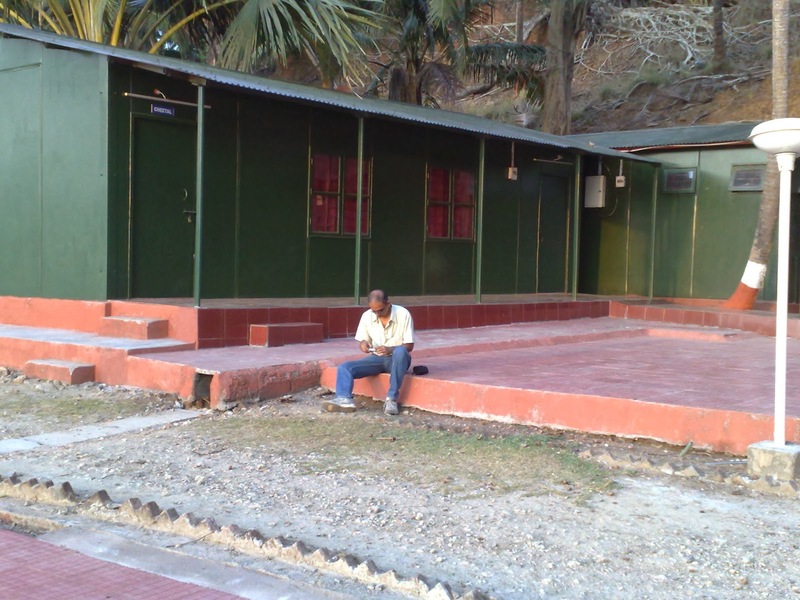 On the one hand in Port Blair, one could see the harsh conditions of the solitary confinement of the Indian freedom fighters and here on Ross island one could appreciate the efforts made by the British Officers to build a home away from home. Somehow I just couldn’t make myself hate them. 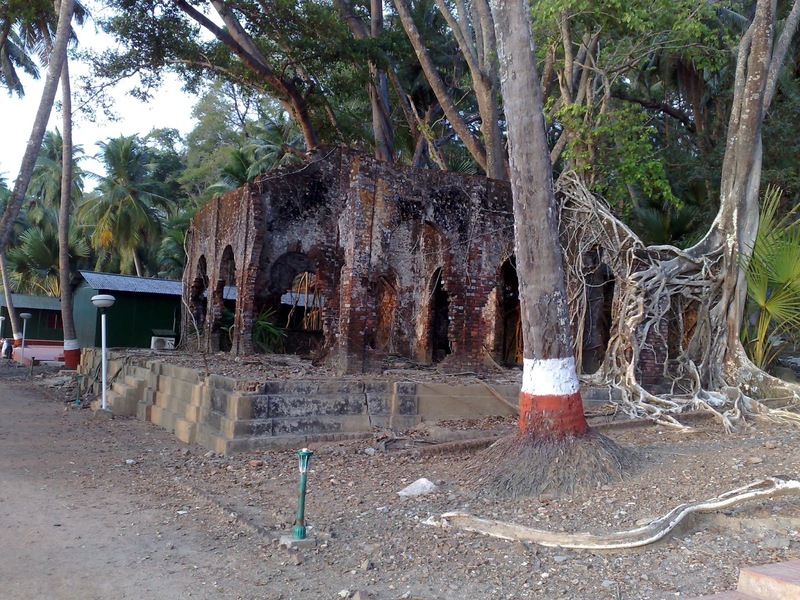 According to the history, the Japanese invaded and took over the island from the Britishers and beheaded the then Chief Commissioner in front of the clock tower near Aberdeen jetty in Port Blair. They built a bunker on the island, which can still be seen and after the world war was over, the island was again taken over by the British, only to leave soon again as India gained her Independence on 15th August 1947. They handed over the island to the Indian Navy. But the island remained uninhabited for a long time afterward due to rumors of it sinking. It feels sad to see the ruins in this state today.After a hearty breakfast and tea at the cafeteria we left to pack our bags to go back to Port Blair. And the next day we caught the early morning flight back to Chennai and the connecting flight from there to Mumbai. Enjoy Para Sailing In Goa This Summer! A Plea - Stop Polluting The Andaman Seas!